Smart Architecture, recently issued by 010 Publishers is a light-hearted book that presents a range of solutions for sustainable architecture with none of the sandals-and-woolly-socks business, writes Luc de Vries. Entitled Systems, the second chapter focuses on cyclical systems that display a measure of self-sufficiency. Schemes highlighted include inhabitable space stations that have their own source of food, the Biosphere-2 of course, and also a glass paperweight that contains a complete food chain. There are also designs for zero-energy dwellings and buildings where greenery is deployed as a functional element. Grouped under the heading Efficiency are numerous projects in which smart technical applications have resulted in lightweight buildings that require minimum amounts of energy. The final chapter, entitled Process Practice, sets out the vision and work method of five architecture firms that practice Smart Architecture. For those who think that sustainable architecture is always about a wooden buildings with pitched roofs, overhanging eaves, asymmetrical façades, at least one round window and timber cladding at strange angles, this book is a must. Those who’ve followed the professional journals in recent years won’t find much in the way of news. What is new is the sheer breadth of projects, information and ideas that can all contribute to sustainable architecture. It’s that diversity of perspectives that sets this light-hearted book apart. So, too, does the book design: handy format, clear layout, off-white recycled paper, and lavishly illustrated in colour. This is a smart pocketbook with minimum environmental impact and maximum technical impact. Over the past five years the SLA Foundation has compiled examples of what it calls ‘Smart Architecture’ on its website smartarch.nl. Availing of every imaginable technique in an open-minded way, Smart Architecture advocates construction that has as little impact as possible on the environment. Call it sustainable architecture if you like. Whereas Eco-Architecture often resorts to Arcadian imagery, and Techno-Architecture often amounts to little more than a show of flexed muscles, Smart Architecture effectively utilises technology and science to create buildings that require a minimum amount of material and energy and that result in sustainable planning. 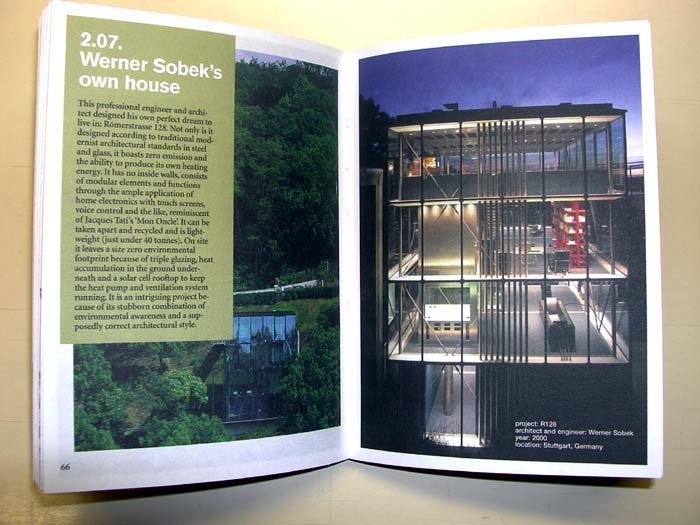 Some of the examples collected by Smart Architecture have now been brought together in an English-language publication entitled Smart Architecture. Divided into four chapters, the book presents each project with a short text and one or two images. The chapter Time features projects in which time, and a clever use of it, constitutes the central idea. Buildings featured include the Eco-Cathedral by Le Roy for its timelessness, the Groothandelsgebouw (‘Business Centre’) in Rotterdam for its adaptability, and the Meerpaal in Dronten for its flexibility. Included, too, is New College in Oxford, and the story goes that oak trees were planted in the nearby woods while the main hall was under construction so that timber elements of sufficient size would be available after 350 years to replace the ceiling joists. Smart Architecture, Ed van Hinte, Marc Neelen, Jacques Vink and Piet Vollaard.